If I remember it right, I haven't yet written about my obsession with the 4th of the month. My obsession, which is fast becoming Jhay's too. LOL. We've been together for five years but believe it or not we are still celebrating monthsaries. And a few hours ago was our 62nd month. That means it's date night! 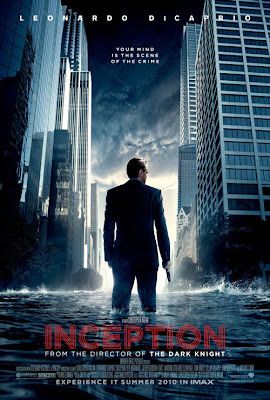 Early on, we knew what we're gonna do -- watch INCEPTION. Only a few minutes into the movie and I was telling myself, "WTF". There were times Jhay and I were laughing because we are so lost already. I remember scratching my head countless times because all I get was the idea of subconscious, dreams and idea itself. But I have to say that it's good because it really really kept me up the whole 2 hours and 15 minutes, even if almost half the film what I see are characters sleeping. LOL. The story line was very well thought of. Kudos to the writer for keeping his sanity intact, because watching the movie almost made me lose mine. Hahaha. The movie had great effects too! And the cinematography, superb! Funny because I don't want the movie to end just yet because I still have a lot of questions left unanswered. And as we exited the cinema, Jhay and I were still asking each other the same questions. Our bottomline? Let's just google them! haha.